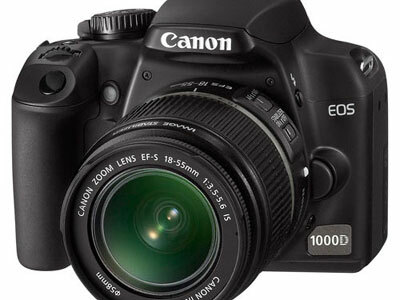 Novices won’t find it hard to get acclimated to the feel of a true DSLR with the EOS 1000D. The camera’s ergonomics and control and button layout make it easy to tame. It has excellent weight distribution, which is an important factor to consider especially for those who are just beginning to get their grip on this kind of hobby. At just around 500 grams, the camera feels light in the hands, making shooting whatever you fancy a non-physically stressful experience. The weight might be an issue of taste though as Techie.com.ph’s review of this camera says it might be just a little too light. The 1000D features a 2.5 inch display which is crystal clear allowing you to see and examine the pictures you’ve taken in a more detailed manner. Its 10.1 megapixel sensor and Digic III processor make for some pretty stunning pictures, although we’re betting you won’t be winning the Pulitzer prize anytime soon. As expected of an entry level camera though, the picture quality heavily diminishes in less than optimal lighting situations. In the case of the 1000D, the SDHC (High Capacity) memory format is utilized. SDHC format cards can hold up to as much as 32 gigabytes of memory. With the larger capacity, it won’t be necessary to use multiple cards anymore, meaning more snaps, and therefore more time honing your skills rather than transferring images from the cam to your PC. But all in all, what makes the 1000D a real good choice for beginners is its price. At just P34,000 the camera’s set of basic features and great feel make it a good training camera and for getting your feet wet. So really, you can’t go wrong with the 1000D if all you want is to have a DSLR hanging on your neck, and takes better pictures too than your conventional point and shoot.